This was a reawakening of a long term interest. I’ve always enjoyed gardening. I began to grow summer flowers in a window box outside my room at college, and attended my first flower show while in college in 1953. After marriage and moving in to navy housing I went nuts with gladiolus in our 2′ x 4′ plot. Then I tried raising snapdragons from seed. I didn’t think they looked quite right so I asked a knowledgable friend who looked at the flat and pronounced them to be healthy chickweed seedlings. That worked so well that I built a three-shelf-high, 4′ x 8′ planter equipped with twelve 4′ long, dual-tube flourescent light fixtures so that we could enjoy flowering plants in the winter….the second season. I raised all manner of gesneriads, impatiens, balsam, browallia and begonias which do well under low light levels, but I also brought stock and dwarf marigolds to fragant bloom along with other summer annuals. It was about seventy-five square feet filled with color in the harshest depths of winter. A business partner once told his secretary that when he died he wanted to be laid out in my basement. I moved it to the basement of our next home and kept plants going in it and then in successor wall shelves for some thirty years. I toiled through infestations of leaf and soil mealy bugs, spider mites, scale, cyclamen mites, red spiders, root rot, and mildew but I was finally brought down by thrips. I just couldn’t get all the plants cleaned at once so I threw in the towel except for a two shelf cabinet in the family room until I moved last year. If any of them showed problems they were evicted. Tough love. So, now I’ve started up again, and it’s a joy to walk into the sun room in the morning and see all the plants, vigorous, in bloom, perhaps even purring. What triggered this post was the Streptocarpus shown below. 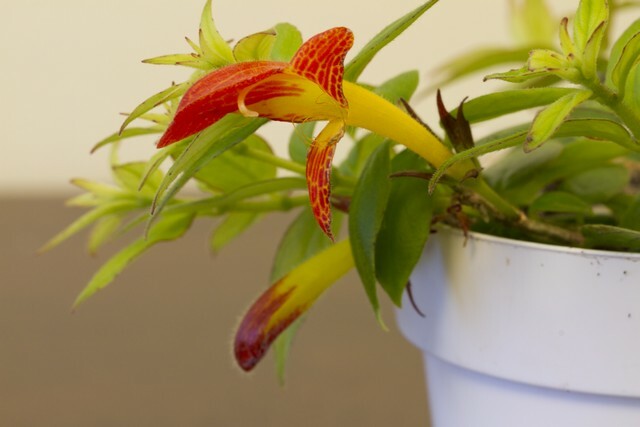 From flowerless it has burgeoned with over two dozen blooms. Also exciting for me is this Abutilon or Flowering Maple. I used to see it in the Park Seed Co. catalog but had never tried it as it’s a full sun plant. But, my friend, Nancy B., has a large specimen growing in her sunroom so I thought I’d try it. It has done well under the lights, rewarding me with a few unusual blossoms. This Columnea (Gesneriaceae) is another joy for me. I had this particular variety for most of my years of light gardening, keeping it going by taking root cuttings and developing them. But it also fell victim to the thrips and, finally, my tiring of that struggle. Then I found it in the Logee’s catalog and invited it to come back home. The colors make me think of candy corn, and the blooms, of some exotic dolphin leaping from the water. They look good, you have a green thumb.. Don’t let that Oxsalis (upper right) re seed in nearby varieties or it will take over. I’m working on orchids, one is going great guns, a second is doing well and the Keikis only so-so. I didn’t know you did this! I have done this for decades, starting seeds under fluorescent lights (mainly things you can’t buy as seedlings, both flowers and vegetables). Jeanne Lorenzo also starts a bunch of stuff every year in her basement. Here in Ojai I have a small setup under the cabinet, on top of my 4 cubic foot refrigerator. Even in this climate, it makes sense to start things off indoors in a controlled environment. Instead of a heating mat, I just use a string of christmas lights under a wire shelf that supports the trays. The trashpicked wire shelf is an inch high, which is perfect clearance for the lights. It’s exciting to wake up in the morning and see if anything new is going on in the seed trays. Meant to also say that I have grown the Abutilon from Park’s in the past, and got a variety of colors. Never ran into anyone else who knew what it was though. Maybe it’s time to seek it out again. Funny … I had a photo of Abutilon from FL and you (Terry) informed me what it was! AIn’t it all fun!?! Clever idea, the string of Christmas lights. I’ve always felt inspired when I see tiny leaves break through the soil covering, from a tiny, dried-out seed . It says something positive about life. Great post Ralph! What a great hobby! I look after some orchids and houseplants myself and enjoy it. Thanks for the link. I need a purple passion plant. You know … I haven’t been to Longwood since our trip last winter. I hope to get there some time this month. I could kill any of these in a week. Thanks for sharing! Nothing personal, Jenn, but please stay away. A gardener after my own heart! I just bought a small outdoor greenhouse so I will be able to harden off many of the seeds I will start next month. This year I am concentrating of various types of poppies, especially the hymalayian blue (sp), Hopefully the garden here at the new house will come up and we as nice as I had at the old house! You never know who’s going to turn up as a gardener. Have you photographed Kathy L.’s place in the spring?